Pamukkale is one of the best natural attractions in Turkey. Pamukkale means “cotton castle” in Turkish. It is an interesting site with hot springs, strange and weird terrace pools in the Denizli Province at southwestern Turkey. The place is located in Inner Aegean region at the River Menderes valley, where there is a temperate climate for most of the year. 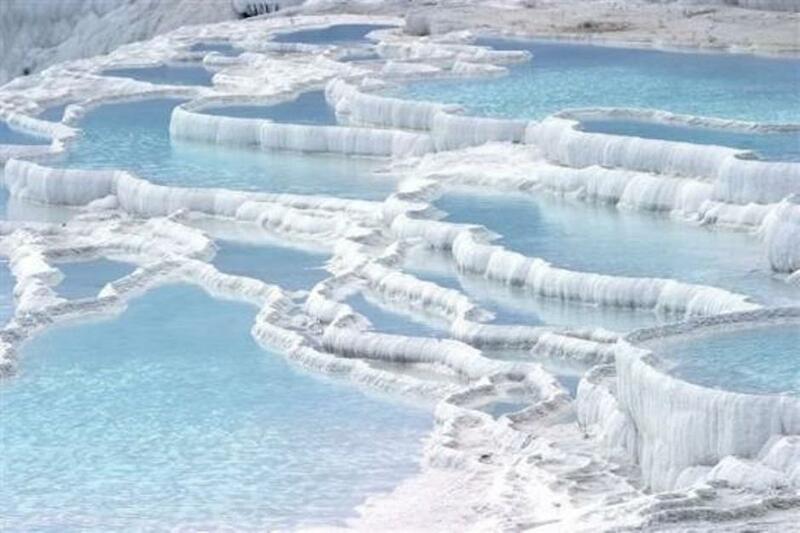 The terraces of Pamukkale are made of travertine that is a sedimentary rock deposited by water from the hot springs. These hot springs were formed thousands of years ago by earthquakes. The hot springs brings water rich in calcium carbonate to the surface. When the water reaches the surface, carbon dioxide in it is released and the calcium carbonate deposits on the surface. This process continues till the carbon dioxide in the water becomes equal to the carbon dioxide in the air. Initially the calcium carbonate that is deposited is soft like jelly but eventually it hardens into travertine. This happens because of the weather conditions there. 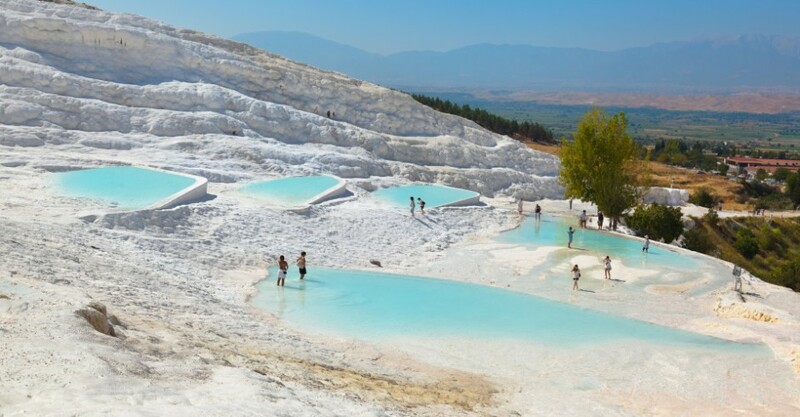 Many tourists and locals visit Pamukkale not only for its incomparable natural look, but also for wellness. There is a legend behind this. According to the legend there was an ugly young girl. No one wanted to marry the ugly girl and so she decided to commit suicide. She climbed the travertine and jumped in the pool. She did not die but a miracle happened. The water of the pool turned her into a beautiful girl. The lord of Denizli saw her and fell in love with her and soon they got married. Believing this legend, people believe that the water improves the appearance of a person. It is also proved scientifically that the water cures many diseases. The mineral water of Pamukkale has been found to cure high blood pressure, kidney stones, stroke, nervous and physical exhaustion, nutritional and chronic disorders, rheumatism, eye and skin diseases, circulatory and digestive problems. Pamukkale is attracting tourists not only for its natural travertine but also its healing waters. It has become a spa resort today. Mammoth hot springs in USA: It is a large complex of hot springs on a hill of travertine in Yellowstone National Park adjacent to Fort Yellowstone and the Mammoth Hot Springs Historic District. Badab-e Surt in Iran: This place in the Mazandaran Province in northern Iran has a range of stepped travertine terrace formations.